State Bank of India, India's largest bank, has published its 2016 notification for the recruitment of Probationary officer (PO) to fill 2200 vacancies all over India. PO in SBI is a highly attractive and prestigious job profile for aspirants seeking a job in banking sector. It is also considered one of the toughest recruitment exam taken to grab a job in government or PSU sector. It is also attractive because of the job status and its payout which accounts between minimum 7.55 lacs and maximum 12.93 lacs rupees depending on place of posting. Before preparing or filling the form, you should have requisite knowledge of exam pattern, syllabus and types of questions asked in the examination. Hence, there is a glance of exam pattern and syllabus to get you aware what you need to study. All banking recruitment exams have changed their pattern. There will be three phases in SBI PO examination. Phase-I (100 marks) will be preliminary test only of qualifying nature (marks will not be added in final phase). 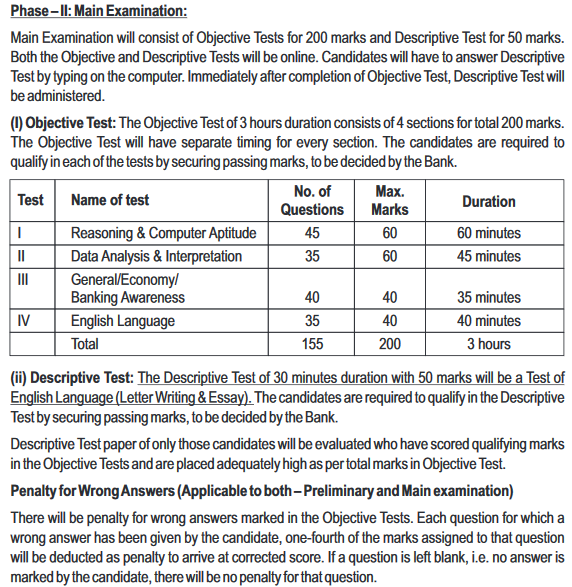 After clearing phase-I, there is mains, named Phase-II (250 marks- Objective of 200 marks and Descriptive of 50 marks) which is important and on the same pattern as previously taken by SBI. After this there is another phase, Phase-III (50 marks) in which passed candidates have to go throw GD and Interview process. Final Selection: Marks of phase-II marks scored will be aggregated or converted to 75, and phase-III marks into 25, so that total final marks can be taken out of 100 and final cutoff will be declared accordingly. There are 4 sections which one has clear individually as there is criteria of sectional and overall cutoff both. The four sections- Reasoning and Computer Aptitude; Data interpretation; English language and comprehension; and Current/Banking affairs. All these sections are equally important and must to practice a lot to solve the questions of SBI PO exam. Reasoning section consists of Syllogism, Inequality test, Coding and Decoding, Input-Ouput, Linear Sitting Arrangement, Circular Sitting Arrangement, Statement and Course Action. These topics are important and need to command the types of questions asked on these topics. Mostly the pattern is of 5 questions on each topic are to be attempted. And, if you not properly understand the question, you will not be able to solve all related 5 questions based on the statement of the question asked. In computer, it will be easy to mark the answer as the basic questions on computer knowledge are asked. If you have basic computer knowledge notes, you can easily mark all answers rightly. If you take note of previous papers, Data interpretation is the toughest one and need lots of attention to prepare. It consists of Pie chart, Bar graph, Line interpretation etc and on each chart there is 5 related question with high level of calculations required in limited time. There is less time and more calculation required to solve questions on this section. It is a single specific strategy according to which one can score in this section. You have to just follow current affair magazines like Pratiyogita darpan, Yojana, Chronicles, bankersadda compiled current affair pdf, gktoday.in current affair pdf, affairscloud monthly current affair pdfs. You can follow any of these and it should be last 6-8 months current affairs before the exam. You have to also cover banking sector current affair, government policies, world country's currency and capital (2-3 questions asked), Government and World organization headquarters. To lessen your stress on current affair preparation, we would suggest to download gktoday.in pdfs or bankersadda compiled current affair uploaded before the exam every time. It will really help you a lot to solve current affair questions. English comprehension are also tough one for the students as it's PO examination. One has to practice lots of comprehension to answer the related questions of it. Usually, 15-20 marks of question are asked in Mains examination, whereas normal level comprehension are to attempted in Pre examination. There are also fill up, error correction, synonyms, antonyms, jumbled sentences which need to be done to clear this section. It does not take more than 20-30 minutes to attempt this section, if prepared well. 1. Refer the books for Competitive exams especially for DI, English language and Reasoning sections. As, the questions are usually tougher than SSC or Railway recruitment exams, and even asked in different way. 2. Practice and make schedule before 3-4 of the examination. As, it is Online examination requires more concentration and speed with accuracy to crack the examination. 3. Read compiled GK pdf from Bankersadda.com or GKtoady.in or Affairscloud.com, if you want to spend 15-20 days on it prior to Mains Examination. 4. More focus should be on solving more correct questions rather than attempting all questions. Read the question in the exam, then try to solve, if could not solve in 1-2 attempt just move on to another. Time is important factor in the examination. 5. Don't rely on just one section only as one has to clear sectional cutoff. Attempt good number of questions of each section and then, immediately shift to other instead attempting all questions of one section. 6. The way of attempting sections may depend on your strategy and practice. But, there is one way of doing exam in given time. GK and computer questions take less time, try to attempt them first, then English language, Reasoning section and then, DI (consumes most of the allotted time). Comments "Effective tips to prepare for SBI PO examination"